Jarrod Uthoff, a former Mr. Basketball at Cedar Rapids Jefferson High School in Iowa, has returned to his home state after transferring from Wisconsin. He'll have an uneasy reunion with the Badgers Sunday night in Madison. MADISON, Wis. — The day when Jarrod Uthoff would return to the Kohl Center was inevitable once he announced his decision to transfer basketball programs from Wisconsin to Iowa. Now, that day is less than 48 hours away, and much of the intrigue surrounding the game will no doubt center on both the redshirt sophomore and the fans who are sure to jeer him. No. 22 Iowa (12-2) travels to face No. 4 Wisconsin (14-0) early in Big Ten play at 7 p.m. Sunday, and Uthoff has emerged as one of the Hawkeyes’ standouts. Though he has not started a game, the 6-foot-9 forward ranks third on the team in scoring (10.9 points per game) and first in rebounds (6.5). But it is what took place away from the court nearly two years ago that will surely be on the minds of those inside the arena. Uthoff spent one season at Wisconsin and became a national story back in April 2012 when he asked for his scholarship release. Uthoff did not inform Badgers coach Bo Ryan directly of his intention to transfer, and Ryan initially restricted him from contacting schools in the Big Ten, as well as Marquette, Iowa State, Florida and all Atlantic Coast Conference schools. Ryan told media members at the time that his reason for restricting schools was done, in part, because he wanted Uthoff to explain to him why he wished to attend certain schools on his list. He said the only way to get Uthoff to talk was to restrict schools and thereby force Uthoff to appeal, although appeal conversations were held without Ryan present. Ultimately, Uthoff appealed the restrictions by meeting with athletic director Barry Alvarez and assistant athletic director Justin Doherty. Wisconsin lifted all transfer restrictions soon thereafter except for those in the Big Ten. 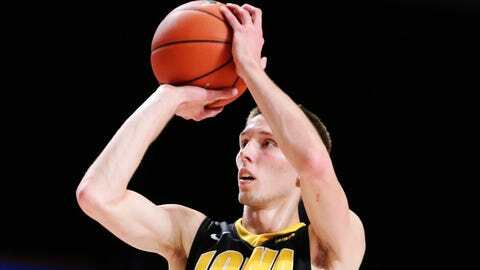 Uthoff, a former Mr. Basketball at Cedar Rapids Jefferson High School in Iowa, wound up with the Hawkeyes anyway. He was not allowed to contact Iowa’s coaching staff until he enrolled and arrived on campus in the fall of 2012. He also did not receive a scholarship last season and was forced to sit out. A year later, he is thriving in an up-tempo system in which 10 players play at least 13.6 minutes per game. "He had a unique game," recalled Badgers center Frank Kaminsky, who was in Uthoff’s recruiting class at Wisconsin along with point guard Traevon Jackson. "He was more of a face-up four man. He’s got a great jump shot. I remember in practices, he would get really hot and make a bunch of shots in a row. I know personally he can get hot. He’s a good scorer." In addition to his skill, Wisconsin players also remembered Uthoff’s bizarre exit from the program. They recalled Uthoff attending an open gym in April after the season ended, only to be pulled away at the coaching staff’s request because he had already asked for his transfer release. "It was just a regular open gym," Badgers guard Josh Gasser said. "He played with us. We had a workout. We all went back to the locker room, showering. Getting something to eat. And then all of a sudden, Z Bo (Zach Bohannon) came in and said he was transferring. I was like, ‘What? He just played with us.’ It was just kind of a weird situation. Usually you expect someone to tell you or expect to hear it in different ways, but it didn’t happen. "It was just weird that we found out via Twitter or whatever it was. The Internet. You play with a guy for a year, you kind of expect that they’re going to come to you and talk to you about it. He did what he thought was best for himself and his family. You’ve got to respect that." Jackson, too, said he was shocked by Uthoff’s decision because no one on the team saw it coming. "I understand where he was coming from, though," Jackson added. "The situation here at Wisconsin is hard. It’s tough. Mentally, you have to be able to handle this. All of us freshmen here were kind of going through the same thing. He made a decision that he felt would be best, where he could be at his best. I’m happy for him." Badgers players said they expected the fans’ reaction toward Uthoff to be hostile, but they also noted it would not change their mindset toward the opponent. Wisconsin is trying for its first 15-0 start to a season in 100 years. Iowa officials declined to make Uthoff available to the media in the lead-up to the game. Badgers assistant coach Gary Close, who recruited Uthoff, said he had not been involved in a situation quite like what transpired roughly 21 months ago. Close is in his 27th season as a Division I coach and 11th at Wisconsin. "You’re in this thing long enough, you see everything," Close said. "You move on. We would have liked to have had him stay. But for whatever reason, he felt it was better for him to go. It’s like an injury. The next guy in. You move on."